AmaWaterways will introduce four new itineraries and two new ships for its 2013 season. With new itineraries in France, Spain and Portugal, AmaWaterways has expanded to 15 ships and 25 itineraries. “AmaWaterways continues to lead the industry by adding two new ships that feature spacious cabins, gourmet fine dining and unforgettable tour excursions that immerse travelers in the local culture and history. The overall quality of river cruising is changing,” said AmaWaterways Founder Rudi Schreiner. The AmaPrima will debut on the European sailings in April 2013. This 164-passenger vessel will feature spacious staterooms, most featuring two balconies, a heated swimming pool, multiple dining venues, 42-inch flat-screen TV in staterooms, and complimentary Internet, Wi-Fi and infotainment system. The 108-passenger AmaVida will debut in 2013 in Portugal. The newly built vessel will cruise Europe’s Douro River Valley, a UNESCO World Heritage Site. The AmaVida features balconies in most of its staterooms and suites, which range up to 323 square feet. The ship will offer gourmet dining with local wines, as well as a casual al fresco dining option. The AmaVida also features a sun deck swimming pool, fitness center and spa, complimentary in-stateroom Internet access on a 42-inch flat-screen and ship-wide Wi-Fi. The 10-night “Enticing Douro” itinerary will start with three nights in Lisbon and will visit Lisbon, Porto, Régua, Barc d’Alva, Vega Terrón, Pinhão and Bitetos. The itinerary will include excursions to the countryside of the Trás-os-Montes Region; Salamanca, a UNESCO World Heritage Site; a Castelo Rodrigo tour; Palacio de Mateus palace tours and the 14th century Alpendurada Monastery. The voyages will operate from March 23 to Nov. 2, 2013. The 13-night “Port Wine & Flamenco” itinerary starts in Madrid, Spain. Passengers will embark the AmaVida in the Spanish border of Vega Terrón. 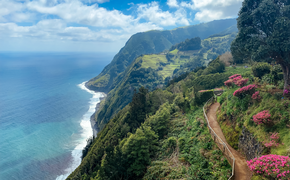 The cruise will visit Pinhão, Trás-os-Montes and Bitetos before visiting the northern capital of Portugal, Porto. The journey ends in Lisbon. These voyages will depart from April 20 to Oct. 12, 2013. AmaWaterways will also debut two additional itineraries in France March 2013 that include Seine River cruises aboard the AmaLegro from Paris. Information is on the company website.